After discovering that fertile lands really did exist, Judge John Sturgis came to the St. Joseph Valley area in 1827 and purchased a parcel of land that is known today as Fawn River. His original homesite can be seen at Pioneer Park. A few years later, future Michigan Governor Lewis Cass was part of a surveying team visiting the area to attend a Native American treaty pow-wow. On his way back to Detroit, Cass enjoyed dinner at the Sturgis home. After he was elected, Cass had the opportunity to name the settlement and is said to have been so impressed by Mrs. Sturgis' biscuits that he insisted the town be named in her honor. The arrival of the Michigan Southern Railroad in 1851 gave rise to fast growth for the area. 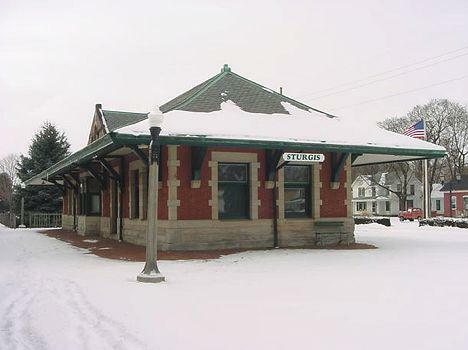 The Old New York Central Railroad Depot, built in 1893, still stands and today is home to the Sturgis Historical Society Museum and the Sturgis Chamber of Commerce. On January 31, 1896, Sturgis became incorporated as a City. While many cities of the same size were still in the dark, Sturgis became known as the Electric City. 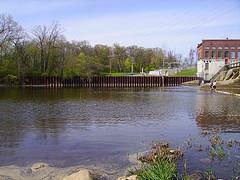 City leaders installed a 150-kilowatt, alternating current generator in 1899, but demand continued to grow and in 1905 a dam was built where the John M. Leland gristmill and sawmill had once stood on the St. Joseph River. Today, Chicago Road (US 12) is still the main thoroughfare of downtown Sturgis, a street lined on either side by Victorian era commercial buildings, helping the city retain its historic charm. Special events are held throughout the year, including Sturgis Dam Days at the end of June and the Annual Motorcycle Toy Run in September.